When you’re in search of a new home, sometimes the homes already for sale on the market simply won’t do. Sometimes the location isn’t right. Other times there isn’t enough space to accommodate your family, and sometimes there’s just too much space. Then there are the homes you visit, and you get that feeling deep down in your stomach that something is just not right. 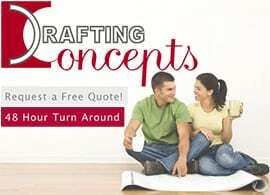 You want a house that meets you and your family’s needs in every possible way, and more often than not, this can only be accomplished by designing your own custom house plans. 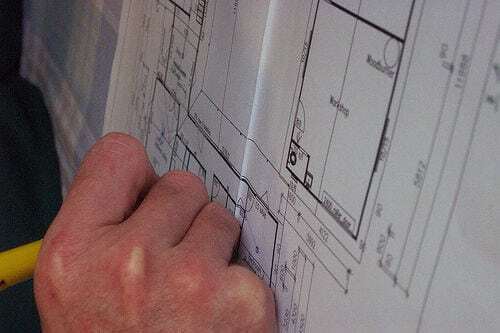 Before you can move into your dream house, you’ll have to hire a draftsman to turn your vision into a reality, but before you can do that, you’ll never at least a general idea of what it is you want in a new home. We all want a unique home that matches our style and needs exactly, and is unlike anything you’ll find anywhere else. This, of course, is easier said than done. 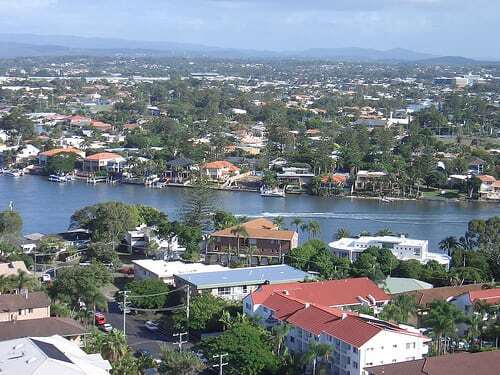 So, before you can start designing the features that are custom-tailored to you, it’s a good idea to look at what’s already working, and the best place to start is with modern house plans found along the Sunshine Coast and surrounding areas. To shed some light on the situation, below we’ve detailed some of the most popular house plans in the region. 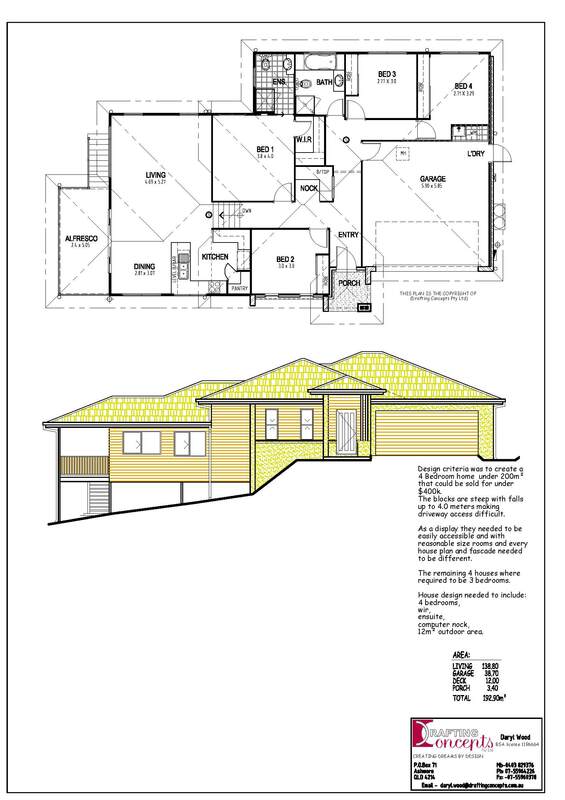 Have a look at these beautiful house plans drafted by Queensland’s own Daryl Wood of Drafting Concepts. 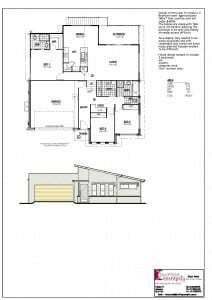 This property was designed to be constructed on a multi-grade site, to be no more than 200 square meters, and sold for under $400k. Inside you’ll find 4 well-sized rooms and 2 full baths. For entertaining, there’s a modest kitchen and dining area, separated by a bar, as well as a large living room area. 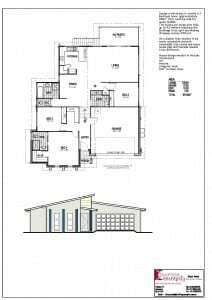 You’ll also find an attached large, double car garage. On weekends and evenings you can relax on the large alfresco, overlooking the side and back yard. This property is smaller than the previous 4 bedroom home, but just as elegant. With slanted roofs, this home also offers a more stylish design, while retaining function. This home includes 3 bedrooms, and 2 full baths, one of a which is an en suite attached to the master bedroom. The master bedroom also features a walk-in wardrobe, and two small front-facing windows. This allows for natural light to enter the room, while still maintaining privacy. You’ll also find a kitchen with bar, a moderately sized dining area, and an alfresco overlooking the back yard. This property is much like the previous 3 bedroom, in size and design, but with a more modern facade. Again, this home features 3 well-sized bedrooms and 2 full baths. The master bedroom has the convenience of a en suite bathroom and walk-in wardrobe, though each bedroom contains sizable closet space. This home also has a kitchen with bar, and a dining room and alfresco that both overlook the backyard. 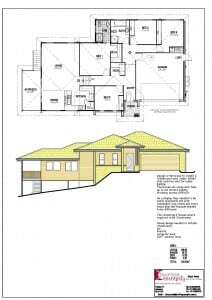 There are many of other house plans for you to look over in search of inspiration and ideas. 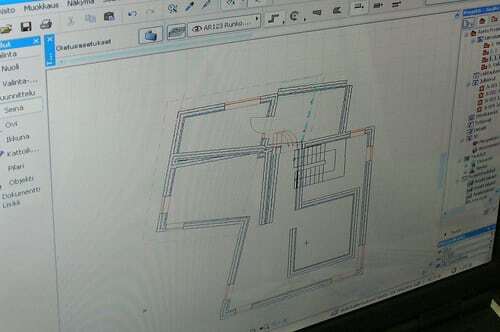 The more you consciously analyze house plan, the closer you will get to your dream homes.